On November 19, 2011 March 12, 2012 By AngeliaIn Into the Blender we go- Wee!, Life is what you make it. Only I would take on such a project…..but seriously…..if it’s the mom’s weekend on the same weekend the studio is rented. Why not offer to do Christmas pictures of her and the girls, just like I did last year? Answer: No reason at all. In fact, it’s genius. I kill two birds with one stone and I don’t have to schedule two different shoots. Why can’t holidays be this easy? Actually, holidays seem to go pretty smooth, so I won’t jinx that. But did you read what I just wrote? I rented a studio! My very own (for 3hours) studio, with strobe lights, and backgrounds included. If you are in the Arlington or the DFW metroplex, I highly recommend this place. Here is their website Arlington Studio. It’s about $50 an hour, and requires a minimum of two hours rental time (subject to availability). If you have several clients, this is no-brainer. I had, technically speaking, four clients. The girls and their mom, the girls with us and Sydney, and my two senior shoots – Sydney and Arden. I used every MINUTE of those hours. So I decide to shoot mostly in what they call high key. This a white floor, and white background. You have lights on the back ground and on the subjects. In camera, you overexpose a bit, and boom. You have people surrounded by white and they “pop”. It’s really the coolest thing ever. I just love high key. 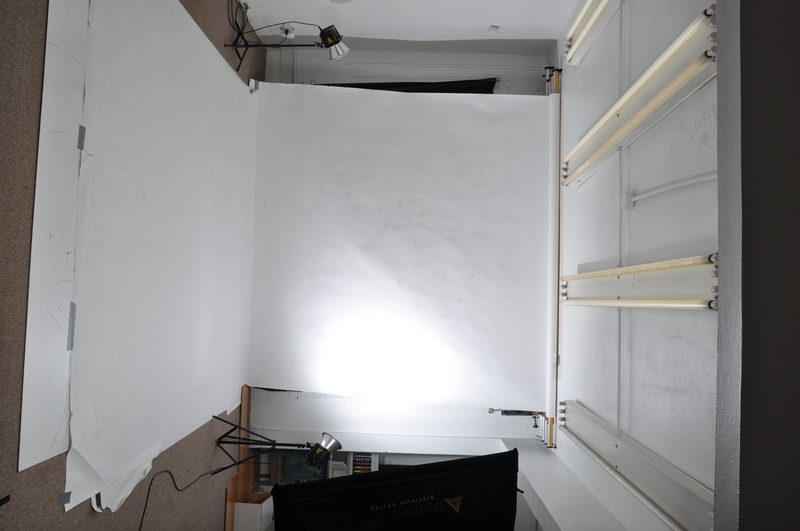 Photo of the high key studio set-up. Once we got going, we had sooo much fun with this shoot. The girls and their mom went first. Then, I stopped shooting and fixed myself to look decent in a our shoot that was after theirs. While I was out of the room I found these images of the girls at play with their mom. We had changed their clothes in preparation for our family shoot. They were dancing laughing, and playing “photography” with mom. And I thought they would be shy….ha! These next photos are not high key (I am saving the real deals for later). We took this in the studio with front lights, and some Christmas lights in the background. The girl’s capture their mom with their shutter fingers and imaginary cameras. I love how they are bending down on one knee. Mom then decides to shoot the girls. I wonder if she knew, she was being shot as well. Lots of smiles shined at the Arlington Studio. I will definitely be sharing our Christmas card when it’s time. This was one of the few times, I have looked at pictures of the girls all together and cried a little. They are all so beautiful and are growing up way too fast for my taste. I’m really thankful to have captured this time together, so I can preserve a special memory in their life. Big thanks to the girl’s Mom. Truly….from the bottom of my heart. I feel more grateful this year than ever. It’s not just the holiday approaching, it really is a time of thanksgiving for all that I have, and all the people that help along the way. Yay. This is great. So glad that it is working for you all. Can’t wait to see these “high key” photos. Thank you! They are pretty cool. I can’t wait to show you! I can’t wait to see the finished products! What a great idea to rent a studio! You are such a wonderful person, Angelia…and a great photographer! funny material for a Christmas card! Aww these are cute! 🙂 Your family is wonderful!